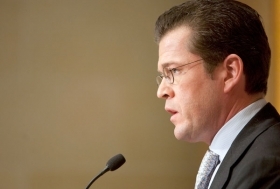 German Economy Minister Guttenberg's comments upset Opel's union boss. FRANKFURT/BERLIN (Reuters) -- Magna International Inc. and Fiat S.p.A. have improved their offers for General Motors unit Opel ahead of a crucial week in which the German government is expected to decide which bid it supports. German Chancellor Angela Merkel will hold a meeting with top ministers Monday to review bids from Magna, Fiat and Belgian industrial holding company RHJ International. No final decision is expected on Monday. The decision on who gets Opel will be made by GM, but the German government will play a big role because it would likely supply billions of euros in financing guarantees. Fiat improved its offer on Saturday after top German officials said on Friday that Magna, North America's largest auto-parts maker, submitted a better plan than rivals. Magna has also improved its bid, a source close to the negotiations told Reuters on Sunday. GM and the German government are in a race against time to finalize a sale of Opel, which is headquartered in Ruesselsheim near Frankfurt. The U.S. government has given GM until June 1 to restructure its operations and prove it can be viable without state aid, or face probable bankruptcy. Fiat CEO Sergio Marchionne addressed fears of major job cuts in Germany and said his plan did not foresee a reduction of Opel's work force in Germany of more than 8 percent, a German weekly newspaper reported. "In the worst case, a maximum of 2,000 jobs would be affected by the integration of Opel into a debt-free joint venture with Fiat," Marchionne told Bild am Sonntag on Sunday. Opel employs about 25,000 in Germany. In a separate interview with weekly magazine Der Spiegel to be published on Monday, Marchionne also said that while there were no guarantees, he currently saw no need to close any of Opel's German sites. Economy Minister Karl-Theodor zu Guttenberg said on Saturday that Fiat had improved its offer and he sensed the other bidders would sweeten their offers as well. For Marchionne, who has already struck an alliance with bankrupt Chrysler LLC, Opel is part of a plan to create the world's second-largest automaker. Bild am Sonntag reported without citing sources that Merkel opposed Magna's bid because it foresees a cut of 2,500 jobs, most of them at Opel's site in Bochum. The city has already been hit after Finnish handset maker Nokia closed a plant there last year and politicians are wary of job cuts ahead of a general election in September. A source close to the talks told Reuters on Sunday that Magna had addressed that issue. "There are indications that Magna has improved its offer," the source said. It might be possible to build Opel's planned electric car, the Ampera, in Bochum. Foreign Minister and Vice Chancellor Frank-Walter Steinmeier and Guttenberg said on Friday a decision on a preferred bidder would come this week. Bild am Sonntag quoted Guttenberg as saying that all offers so far failed to ensure that tax money, which the government was willing to contribute, would not be lost. "Should those deficits remain, a structured insolvency would clearly be the better solution -- that too could open opportunities for the future of Opel," Guttenberg said. That earned him criticism both from Opel's works council head Klaus Franz and Steinmeier. "It is incomprehensible and counterproductive to speak about insolvency when several parties were showing strong interest in Opel," Franz said in an interview to appear in Bild on Monday. "I recommend that everyone finally stops talking about an Opel insolvency. We should focus all our energy on saving as many jobs at Opel as possible instead of unnecessarily stirring up fears," Steinmeier said. Franz also appealed to the bidders to refrain from making promises they could not keep. "Remarks on job cuts need to be guaranteed and put down in writing and remain valid for several years not just for two days," Franz told the newspaper.